Thanks to its revolutionary coating, our Pilkington Activ™ self-cleaning range of glass stays cleaner, all-year round. Its unique dual-action coating uses the forces of nature to help keep the glass free from dirt, giving not only the practical benefit of less cleaning, but also clearer, better-looking windows. 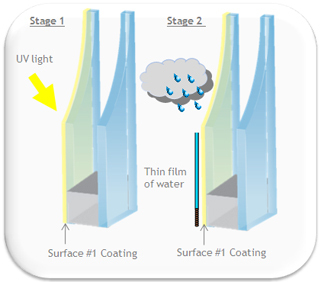 The unique dual-action self-cleaning coating is located on the external glass pane. (Stage 2) When it rains, instead of forming droplets, the water spreads evenly over the surface of the glass, forming a thin film and helping to wash away any dirt and reduce streaks.